I would like to start this post with a public announcement - if you are due to visit the Welsh Quilt Centre this year then don't read on. I had such wonderful visit and part of this was not knowing what to expect so trust me, you will enjoy it much more if you get that feeling of being enveloped in quilting loveliness with no expectations. When we decided to go on a family trip to Wales I knew if I did not get to see some quilts I would feel a tad short-changed. Indeed, the area we visited may have been influenced by the proximity to Lampeter... Then back in April, the centre announced that this year would be its last, so my visit had an additional degree of urgency. It is run by Jen Jones, who I would describe as the custodian of Welsh quilts. She has been preserving both the quilts and their stories since the 1970s and most of the quilts in the centre are from her collection. It is based in Lampeter, a small town in Ceredigion. We arrived early so we could have breakfast before the museum opened but had quite a bit of time to spare as there was none of the horrendous rush hour traffic we are used to and there weren't that many shops to look around. I was a little disappointed as it is a very pretty place, with an interesting history. I know a little about it as it cropped up when researching my family history and my gg great grandfathers were tailors and bakers in the town in the mid 19th century. There are a few good coffee shops though, so if you too get there early you can get a decent coffee and breakfast to fortify you for quilt viewing. On the subject of shops, it does, however, have a gem on the High Street. Calico Kate is a quilt shop almost next door to the centre, and is huge, full of themed rooms so if, say, batiks float your boat you can browse in that room, if it is Christmas you are after then you can shop in there etc. It has a little courtyard which was a good stopping place for my husband who, although happy to look around fabric shops, found the 11 rooms over two floors slightly too much. Anyway, onto the centre which is based in Lampeter Town Hall. The entrance is through the shop which is dangerous. I love a museum gift shop at the best of times, let alone one in a building dedicated to quilts. I managed to put the blinkers on, which was helped by the warm welcome from the volunteers. Had I been there for longer I think I would have got a takeaway tea, found a spot to sit down and chatted quilts. We paid our £7 entry (£3 for children) and headed straight for the first room which had a Janet Bolton exhibition. I have long been a fan of Janet's work and have been lucky enough to attend two courses with her in the past so it was great to step into a complete room of her work. I loved the layout of the room, especially the quilt on the wall. It was not too crowded, so you could appreciate each piece individually, but to see them all together in the space had impact. Next, we went up the stairs into the main room and it was almost overwhelming. 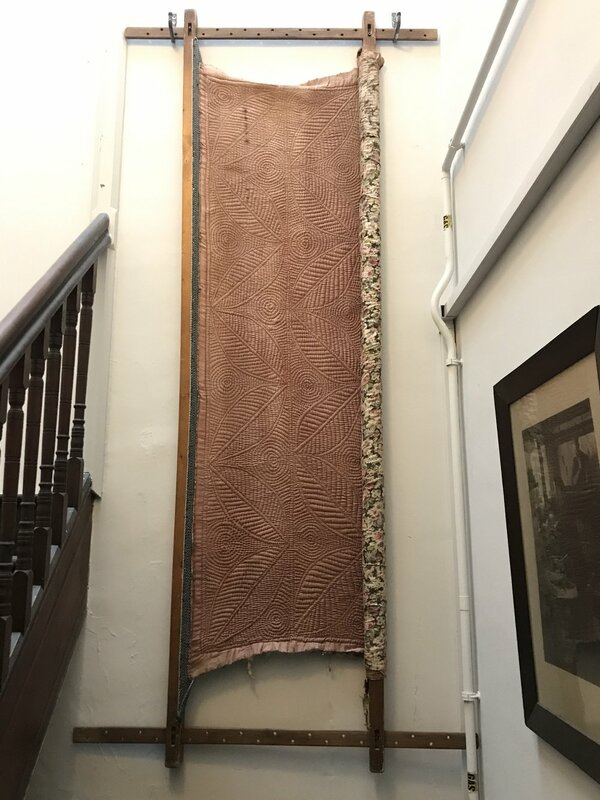 There was old-fashioned music playing, quilts displayed on beds, on walls, from the ceiling - the only way I can describe it is like a warm welcoming quilt hug. The room had such an inviting feel. In my previous research, I saw examples of the evolution of quilt display/presentation over the last 60 years. Before the 1970s quilts were usually displayed how they would be used, so on a bed, or a table etc and displays could be layered. After the Jonathon Holstein exhibition they became seen as art, and so displayed on walls. If you think of Festival of Quilts, that is how most quilts are shown these days. But what struck me about the presentation here was that both had been used, so you could clearly see the quilts, but that their role as bed covers and providers of warmth was a theme never too far away. As 2018 is the centre's last year the exhibition is called Nos Da/Goodnight, and is a retrospective of the exhibitions held at the centre over the last 10 years. This means it is a treat as it spans so much, from the high-end Claridge's quilts, to the utilitarian wool quilts. The room was divided into sections, one for each previous exhibition, and it had the catalogue for you to look through then at least three quilts to view. You could get quite close to them and the visit was perfectly timed as I am hand quilting quilting my largest ever piece at the moment, rocking in a frame instead of using a stabby perle method on my lap and I'm getting a bit uptight about my stitches. So, the biggest thing I took from the visit into my own work was to be kinder to myself. While the the Rural Industries Bureau may not have been knocking on my door (see the exquisite quilting bottom right) this does not matter. A much-loved quilt has something of the maker in, which is often not 'perfect' stitches but an individuality in the process and design which is alluring. It also made me think of simplicity. I have a tendency to overcomplicate everything (in life as well as quilts!) yet many of the quilts that I loved had very simple pieced designs (or just one fabric). From books, I often think of wholecloths as using plain fabric but there were lots here that used patterned cloth. This was my favourite area. I loved everything, the fabric prints and colours, the stitching and of course the fabulous embroidered hound. Called Primmy's Dog it was embroidered by Eirian Short in the early 2000s and is now part of 's. I had a little look around the internet and found this blog post which has some information about Erian and a feature that says this piece was based on a life-size whippet. It is a wonderful embroidery, and works so perfectly with this 'room. My yellow cardigan was very at home in this section. The white, blue and yellow had such a summery feel. The attention paid to the set dressing went right down to the props. It was interesting looking at the chairs that were picked to reflect each theme. There was one more room which had a display of Welsh Samplers. These were interesting, with a range of ability and subjects. They contrasted with some of the ones that I had seen in Yorkshire about fifteen years ago that were made by very young children that featured stern religious text. I found those quite hard to look at. These were different, most had naturalistic themes, with houses and other motifs and felt more craft for all ages than being a tool to make children behave. The colours of the pocket were right up my street, and it cropped up on my Twitter feed last week (unrelated to this, I think it is due to it being in the St Fagan's collection) so the palette is definately drawing me in. This quilt frame hangs on the wall above the stairs. I dream of having one of these in my home. If I had one I am sure I would get so much quilting done, and not just leave coats and the dog lead on it! The final visit was back to the shop. I very nearly bought a 1950s scrap coverlet but we really don't have room for it at home, however, it has inspired me to dig out some of my vintage fabrics and to make my own one. I did buy a few cards though, and a pack of quilt offcuts made up from pieces from 1880s to 1930s damaged quilts. Of course, now I wish I had picked up more as I plan to use this in some of my applique pictures. I hope you have enjoyed my little tour. If you would like to know more about Welsh Quilts I do advise buying this book. I really enjoyed reading it while on holiday in our remote cottage, with the shabby farm buildings outside and the sound of the sheep bleating outside the window. Felt like I had a special little insight into the world these talented quilters lived in.